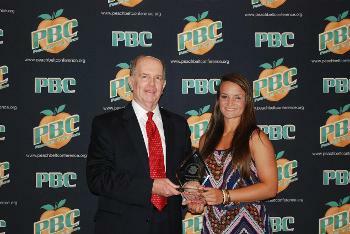 AUGUSTA, GA – Georgia Regents University sophomore softball player Kristen Millswas presented with the Peach Belt Conference Inspiration Award at the league’s annual meetings in Hilton Head on Tuesday. Mills received the award, only the third ever handed out by the conference, for her extraordinary courage and determination in returning to action after suffering an injury that would have ended the career of most players. After becoming a finalist for the GRU Freshman Student-Athlete of the Year in her first season in a Jaguar uniform, Mills took the field in January of 2014 to begin preseason practice for her sophomore campaign. A native of Harlem, Ga., the pitcher was throwing in practice when the nightmare of all pitchers, the come-back line drive, struck her in the eye. Despite the best efforts of doctors and emergency personnel, she lost sight in her left eye. Any human being with sight in only one eye loses the ability to see in three dimensions. The world becomes a flat postcard and it is nearly impossible to triangulate objects in space. In most sports – and especially in softball – the ability to hit or catch a moving ball requires two eyes. Coaches and teammates offered encouragement but inside must have realized that playing collegiate softball at the NCAA Division II level would be – at best – a dream never realized for her. Surgeries and doctors appointments followed, yet Mills was unwavering. So she began to work. Work on restoring what sight she could, work with a bat in her hand, getting the timing back. Work on her pitches, knowing when the ball would break at what point without being able to see it clearly. On Feb. 10, 2015, more than a year after that horrific moment, Kristen Mills stepped into the batters box, bat in hand, and began playing once again. “Softball is very much different for me now,” she said. “Things that came second nature to me before such as simply catching a ball or seeing a pitch to hit are now more difficult, but some extra work in order to continue the sport I love was a small price to pay. She played in 15 games for the Jaguars this season, taking 11 at-bats and getting three hits. She also pitched in seven games, tossing 14.1 innings. But the numbers don’t matter. The mere fact that she was there was enough. The GRU softball team had their best season in years, reaching the NCAA Tournament for the first time since 2012. For inspiration, they needed to look no farther. The PBC Inspiration Award is a special honor reserved for those whose actions in the face of adversity or times of crisis may lead others to act when called upon or serve as an example that moves the spirit. Kristen Mills joins Lander’s Daniel Hannah and Armstrong State’s Daniel Hinley – who won in 2010; and Flagler’s Dave Williams who won in 2011 as the only three recipients of the award.